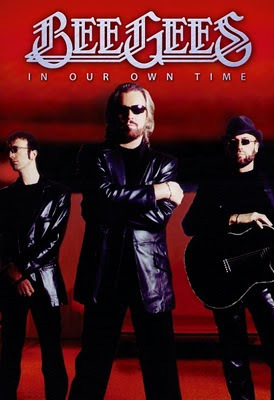 In a career as extensive and artistically diverse as that of the Bee Gees, perhaps the one prevailing theme has been the group’s near-prodigious ability to compose songs that are both of their time and timeless. It's what makes classics like “To Love Somebody,” “Massachusetts,” and “How Deep Is Your Love” seem as vital and moving today as when they were originally released. And it's this distinction that underscores In Our Own Time, a new Eagle Rock documentary that commemorates fifty years of music by the Brothers Gibb. The retrospective is told by the artists themselves, including all-new commentary by Barry and Robin Gibb as well as select and pertinent clips of the late Maurice Gibb, who died in January 2003. Along with a slew of archival footage—from a performance of “Words” on The Ed Sullivan Show to a recording session of “Tragedy” for the group’s 1979 LP, Spirits Having Flown—the overall presentation is as enlightening as it is irresistibly entertaining. In chronicling the highs and lows of their history—including the all-too-brief life and career of their younger brother, Andy—the film traces the Gibb’s evolution as songwriters and composers. Indeed, when the Bee Gees endured the consequences of oversaturation in the aftermath of the Saturday Night Fever phenomenon, they possessed the wherewithal—and the talent—to switch gears and write for other artists. In so doing, they notched sizable hits with the likes of Diana Ross (“Chain Reaction”), Dionne Warwick (“Heartbreaker”), Kenny Rogers and Dolly Parton (“Islands in the Stream”), and Barbra Streisand (“Guilty”), among others. As such, their career continued unabated; it just took a different shape for a while. The immense achievements and stature of the Bee Gees merit more of a concentrated assessment—something along the lines of The Beatles Anthology or Amazing Journey: The Story of The Who—yet In Our Own Time nonetheless does a fine job of profiling one of the most legendary and beloved groups in pop music history.